Listening to the instructions of God, Joshua prepares to take his people across the Jordan River – now at flood level. How are they going to get across? How does the Ark of the Covenant play a part? 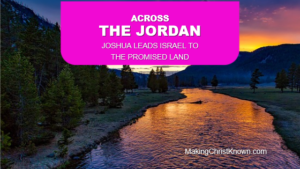 Find out how Israel crosses the Jordan River in this exciting story from the Old Testament. 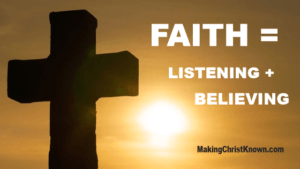 Taking time to listen to God’s plan, Joshua took on the responsibility to lead the people over the Jordan River in order to conquer the land promised by God when He spoke to Moses. What about the “Jordan” We Have to Cross? In our lives, it’s many times difficult to take that first step into new territory – and into the unknown. Many times, our comfort zones keep us from following what God instructs us to do. Not much is said here about the Ark of the Covenant except that it was a symbol of God’s mighty power. and a jar containing manna (Remember manna from heaven?) from the nation’s days of wandering. Remember, this shows the second time we’ve seen the miracle of God holding back an entire body of water. God gave Joshua specific instructions as to how the people were going to cross over the Jordan. Remember, the river was at flood level so the water must have been rushing past at an incredible speed. The priests took the first steps by wading into the raging river with the Ark of the Covenant in their hands. Do you think they were afraid? Most likely, they were terrified! But, Israel stepped out on faith that God would do exactly what He promised. These verses from Joshua 3 hold a couple of lessons for us. The people listened to God’s words through Joshua. By listening, they received very explicit instructions for what they were about to accomplish – with the leadership of God. They had faith that God would see them through the crossing of the Jordan. Also, He insured the defeat of the nations living on the other side in order to take possession of the promised land. Listen & Believe – Israel Crossed the Jordan So We Can Cross Ours..
We have a choice each day to either sit silently for a few moments to hear what God has planned for our lives. Or, we can make a decision to do it all on our own. When we pray, wait as Joshua did for God’s answers. Then, we avoid making so many mistakes in our decision making process. God has something in store for you and me. Maybe it won’t be as spectacular as conquering a nation or the parting of a river. But, it is a job that could affect us in a positive way. If we can only have that bit of faith to “dip our feet into the water“, great things can happen through God. Let’s take a chance and cross the Jordan to help with God’s plan. If you would like to learn more about the love and life-changing experience of Jesus Christ, please take a moment to see John 3:16 now.